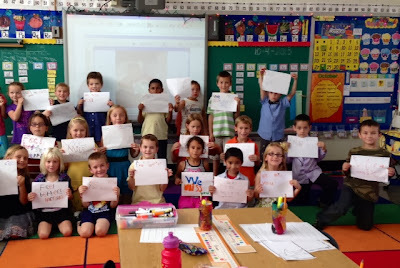 This is a picture of my students sending well wishes to a classmate who broke two bones in his wrist last week. The parents of these children have done a great job helping their kids develop feelings of compassion and empathy. We have been in school a little over 30 days and yet; this group already feels a deep connection to their friend. They made cards with beautiful, heart-felt messages for him. Throughout the day and a half he had to be absent, the students continually checked in with me, hoping for updates about his progress. Everyone really looks forward to seeing their friend again; and lucky for him, a group of kind, loving boys and girls is eagerly anticipating his return.